The main atrium of UW Madison's Art Lofts building, tucked behind the Kohl Center already boasts a well-sized, light-filled gallery. A solid, roll-away partition was replaced with tall glass doors last summer, allowing full view of the art on display as one enters the building's main doors. Moving walls inside the space can create dimensionality and distinction in the space, or be removed to create a sense of openness. But if you pass the Lofts gallery and the infinitesimal but well-curated Gelsy Verna Project Space, you'll see a series of paw prints on the concrete floors. They wend back through hallways of graduate students' and professors' studios, past restrooms, vending machines, and classrooms, ultimately leading to a new gallery space that is, for now, aptly called the Backspace. Doug Rosenberg, a professor of video, performance, and installation art, became UW's Art Department chair about four years ago, at which time he became aware of an old, underused loading dock in the belly of the Lofts. "[It] was filled with old furniture and other junk, but was an artist's dream space," Rosenberg says. "It seemed a perfect space to rehab for our department, so with a lot of help from the Dean's office and other campus partners, as well as faculty in the Art Department, we were able to turn it into the space you see today." Backspace is a bright, well-lit room, with crisp, white walls 23 feet high and nearly 50 feet long on one side, and two garage doors on the other. The floor is polished concrete and reflects the fluorescent lights above. The main is preceded by a small foyer, which can serve as either a gathering place for guests to talk and enjoy snacks and drinks, or host part of the exhibit itself. "I think it's the most beautiful and exciting gallery in town," says Mariah Tate Klemens, a sculptor and third-year MFA candidate at UW. "Physically, it's really interesting because of how large it is, and because it was a loading dock, there are some interesting dimensions and things you don't often see in other spaces. I think also just how beautiful [it] is allows our own work to be elevated, instead of having awkward walls or awkward lighting. I think a lot of artists find, with their own objects, how different work looks in a studio versus a gallery and this is a particularly awesome gallery." Klemens and fellow third year Sculpture MFA Eric Ford installing Klemens’ show at Backspace. Photo by Abrahm Guthrie. Yoshinori Asai is a second-year MFA student in the 4D department with a background in scene design and performance art. His MA exhibition Dear Mr. Good, held in March, was the first student show at Backspace. "I actually used the smaller room to create this smaller world, and then the bigger world," says Asai, whose show combines sculpture, soundscapes, and lighting design. A globe-shaped lamp placed directly on the floor with a soft light, strewn newspapers piled in a far corner, and the figure of a cat lying playfully amongst the print evoke a sense of warm domesticity. Inside the gallery, a single, bare LED bulb usually used for growing plants lights the vast space well enough, but also creates plenty of shadow. Cat drawings and sculptures, most of which are untitled, are arranged throughout—some sitting on the rungs of a ladder, some hung on the wall and made to look as if they're half-protruding out of it, and dozens adhered to the wall all in a row. Purring sounds are projected through a metal basin on the floor, covered in fake kitty litter. Asai was initially supposed to show in Gallery 7, on the seventh floor of the Humanities building, but received an email from the curatorial committee asking second- and third-year students if they wanted to apply to Backspace for their MA or MFA shows. "If I got that other space, my show would be totally different," Asai says. "The gallery [Backspace] transformed my show into something different. I never thought about the show and how it was going to look until I saw it." Normally MA and MFA students at UW-Madison are given one week to install their student shows, have a reception, and take down exhibitions on campus, which gives audiences (especially those not personally involved in the academic art community) a limited window for catching the shows. So, as compelling as student art shows often are, they are often siloed off from the general public. Artists in the Backspace will have three weeks. "I luckily got a spot," says Asai, one of just a few students who will get to show there this year. "Part of the reason why I could make this show was that three weeks. A one-week show including installation is not enough." Asai's experience illustrates an element of the Backspace that Rosenberg is particularly excited about. 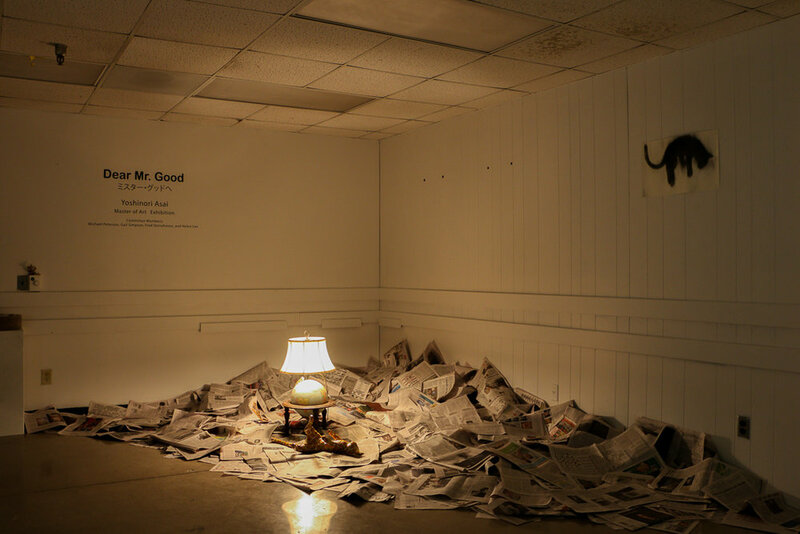 He cited Dear Mr. Good as an example of how the space itself can inform the work and create multisensory experiences for viewers. "[Asai] has choreographed the viewers' experience of the installation by bringing them first into the small anteroom, where there is a more intimate feel, then into the large space, which is darkened and feels both foreboding and exhilarating," Rosenberg says. "He has used the height of the space as well as its expanse and added sound to the visual field as well. This kind of work is not generally possible in a typical gallery space. I think students and others will be inspired to likewise explore the possibilities of an expanded notion of what art can be." While the material aspect of the space certainly sets it apart from other galleries across campus and Madison as a whole, the coordination and curation of the space are unique as well. The gallery as it stands is run almost wholly by students on a volunteer basis. Klemens, who has been helping with the installation and curation of art exhibitions since her undergraduate years, is currently coordinating the selection and curation committee for Backspace. 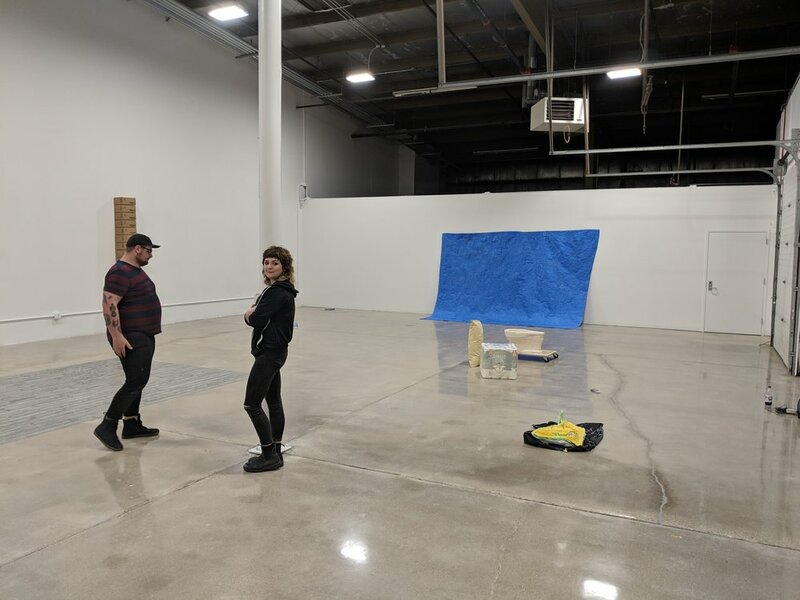 The committee brings in artists from outside the university as well: Milwaukee artist Shane Walsh showed there earlier this year, and Bellingham, Washington-based Cara Jaye will show there from April 22 through May 17. "Sometimes Madison can feel like an island art-wise, because we're not quite close enough to Chicago, and there hasn't historically been a huge exchange between Milwaukee and Madison," says Klemens. "I think that pulling in a broader group of artists over time will help Madison's art scene develop and improve." Klemens feels the opportunity to work in the Backspace is not only an opportunity for professional development, but also crucial to the development of her own art. "Many artists today feel like they also need to some sort of curating, and so this is a great opportunity to be a more multifaceted creator and facilitator," Klemens says. "I think you get to explore different ideas that you're interested in but not necessarily ideas that you're working with in your own practice." Klemens, whose own MFA exhibit, It Costs A Lot To Look This Cheap, opened in the Backspace on April 1 and runs through April 18, with a reception on Thursday, April 11 from 6 to 8, sees the opportunity to both curate and show in the space as an elevation of student work. "After we graduate, technically, we are peers with our faculty," she says. "We have the same degree, we're all artists out working in the world. So instead of thinking of it as a student/teacher sort of relationship, bringing in artists that you feel aligned with or even just engaged with that are out working in the world allows you to sort of make that transition a little bit more seamlessly. Instead of being identified as a 'student artist' you are just an artist." Backspace has a promising future, albeit uncertain—most of the committee members are either graduating this year or unsure if they'll stay involved in running the gallery for the 2019-2020 academic year. It's apparent, though, that with the right curatorial team, and commitment to an ethos of accountability, the space could easily be on par with arts spaces in Madison such as Arts + Literature Laboratory and the Watrous Gallery. Rosenberg is also optimistic about the prospect of the coordination of the gallery becoming a paid opportunity for graduate students. "We wanted to get it up and running as quickly as possible," says Rosenberg. "I am hopeful we can find funding to support a more sustainable solution soon." Katie Hutchinson is a recent transplant to the Midwest from the Pacific Northwest. She studied creative nonfiction, literature, and religion at Portland State University. A longtime lover of music, she is a co-host of indie/folk show Another Green World on WORT and sometimes DJs around Madison. She enjoys both warm and cool beverages, reading, urban homesteading poorly but in earnest, and spending time with dear ones.